As we know, plastic and other waste really is a big problem for our environment – not everyone is as concerned with recycling as they should be, and the result of that is pretty damaging to our earth and animal life. 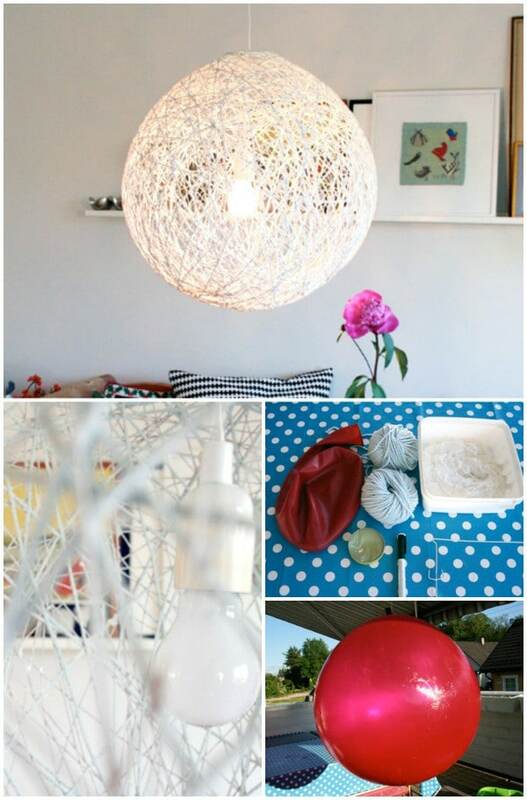 So what if you could combine your love for DIY crafts with doing your bit for recycling? Designer Yaroslav Olenev was named the winner of the Ecology and Design sector of Future Now Magazine for his incredible plastic spoon lamp. This really is a very creative manner to repurpose those utensils you get from take-away ice creams and meals, so start saving them up instead of throwing them in the garbage! If you’ve ever had a paper lantern you’ll know just how easily they are ruined – one little rip and it’s done. Well, instead of discarding of that dainty little thing, you can now transform it into a unique cupcake lantern. 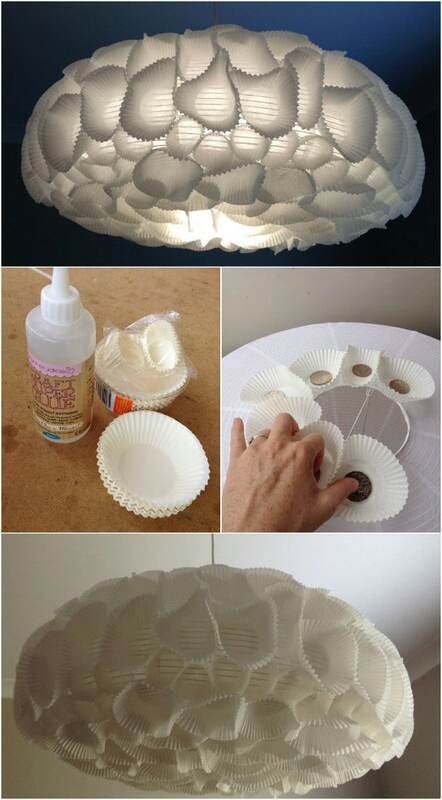 All you need is glue and cupcake liners and you’ve got something completely fresh and new. Here’s another great use for your old, torn paper lantern: a starburst light that actually resembles a cluster of dainty stalactites. All you really need is some vellum paper, glue, scissors, and patience. The project is particularly difficult to do, but the finicky work will take a fair amount of time. This is one of the messier projects, but it’s also a lot of fun. Basically, you mix yarn with wallpaper glue, whirl it around a big blown-up balloon and then pop the balloon once it’s dried. 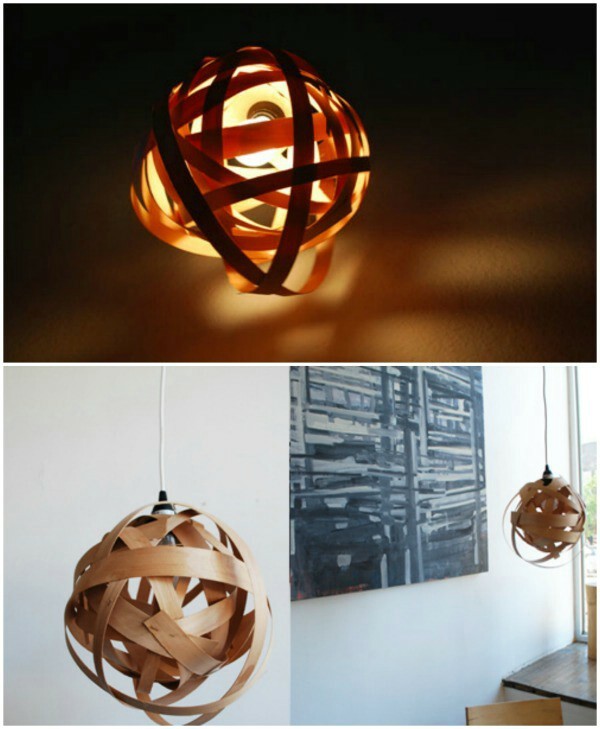 The yarn will keep its round shape and give you an intricate spider-web type lamp shade. It also casts some awesome shadows on the walls. 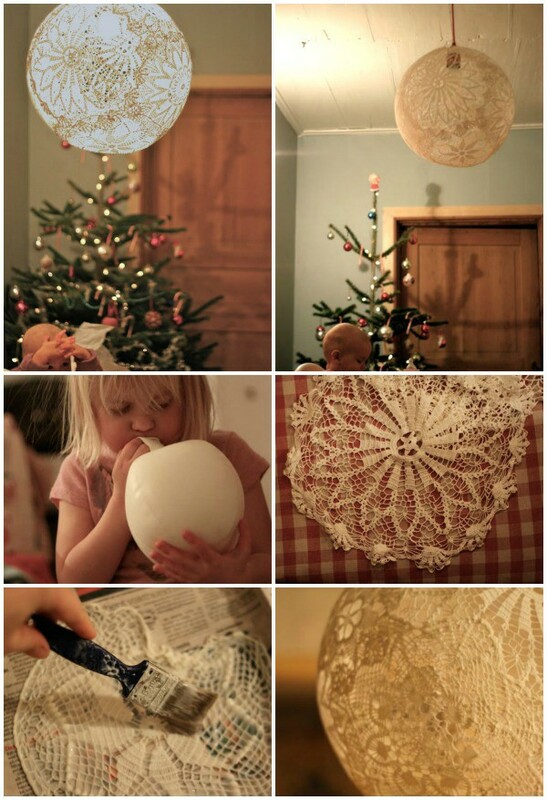 The method and concept for this lampshade is basically the same as the yarn; although for this one, you cover the balloon with doilies (your mom or gran may have some collecting dust somewhere in a cupboard). Make sure to use an energy saving light bulb so that the heat doesn’t melt the glue. 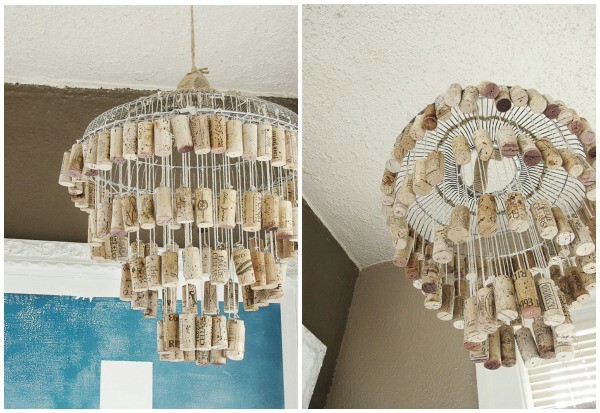 If you’re looking for something to show for all your wine drinking—besides the hangovers—then we’ve found an incredible purpose for your wine corks. If you have an old fan nearby, you can take it apart and use the fan grate as your starting point from which to hang the corks; if you don’t have one and don’t particularly feel like buying a second-hand fan, you could even just get some strong wire and bend it in into a circular (or even square) shape. 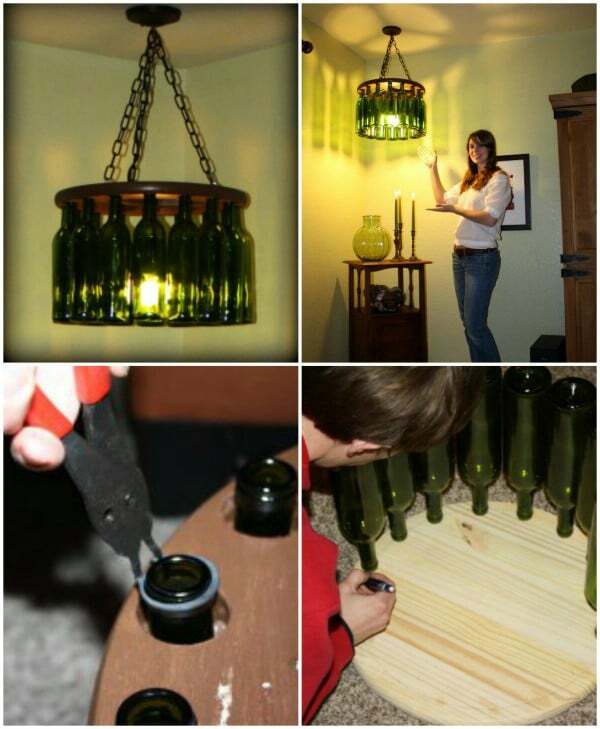 Of course, with all the wine corks come empty wine bottles, so why not put these to use too? A design similar to this costs hundreds of dollars in retail stores, but by taking the DIY route you get to save a lot of money and, more importantly, have the satisfaction of actually having made it yourself. 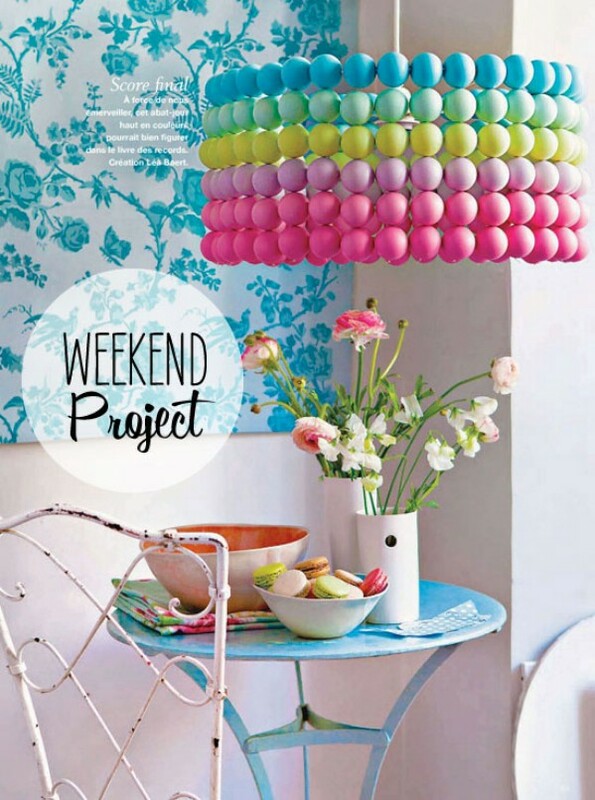 This is a great modern take on a boring pendant light; you don’t really need many supplies and the end result looks like something out of a magazine! With such lightweight material, you can make an even bigger shape if you want to make a louder statement. 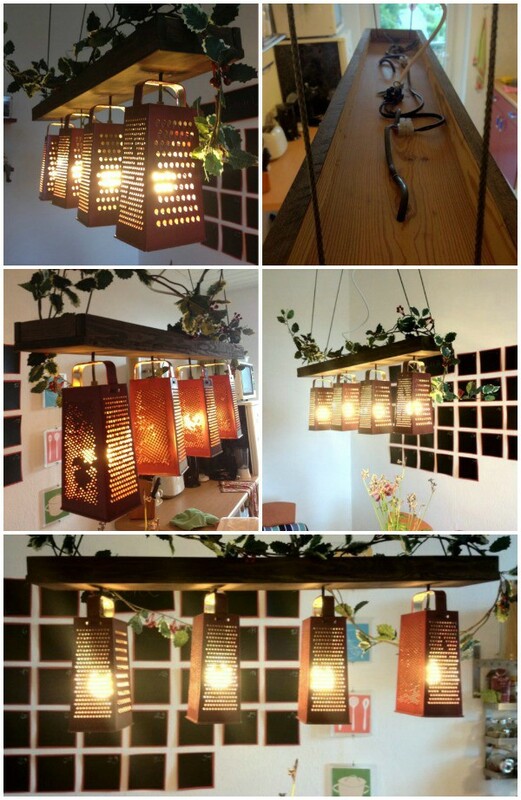 This is a fantastic project for the kitchen above your workspace; old cheese graters! If you want to keep with the recycling theme, instead of buying cheap graters you could ask your friends if they have any old ones to hand over. You’ll just need to drill a hole through the handles to fix them to the wooden beam, and you can even paint the beam and grater-lampshades if you want to introduce some color. 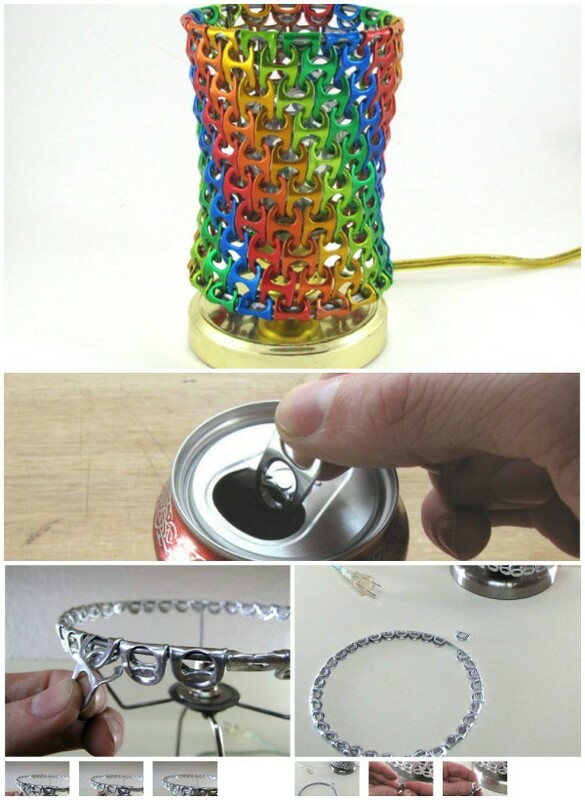 If you’re the type who enjoys a daily soda, perhaps it’s time for you to start saving all those tabs so that you can transform them into a shiny, eye-catching lampshade that looks almost like chain metal, but with a twist, of course. 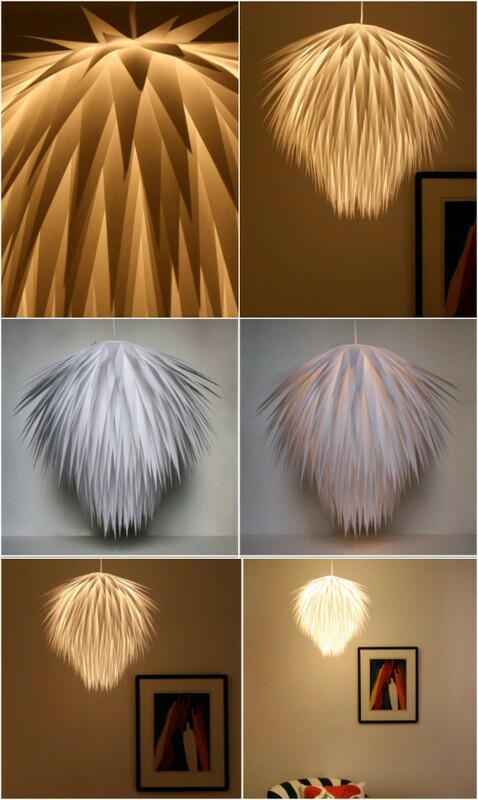 Depending on how many you can collect, you can either make a smaller one for a desk lamp or a larger one for a hanging/ceiling light. Of course, you don’t always have to create a whole new light from scratch; it could be as simple as adding something to an existing one for a whole new look entirely. 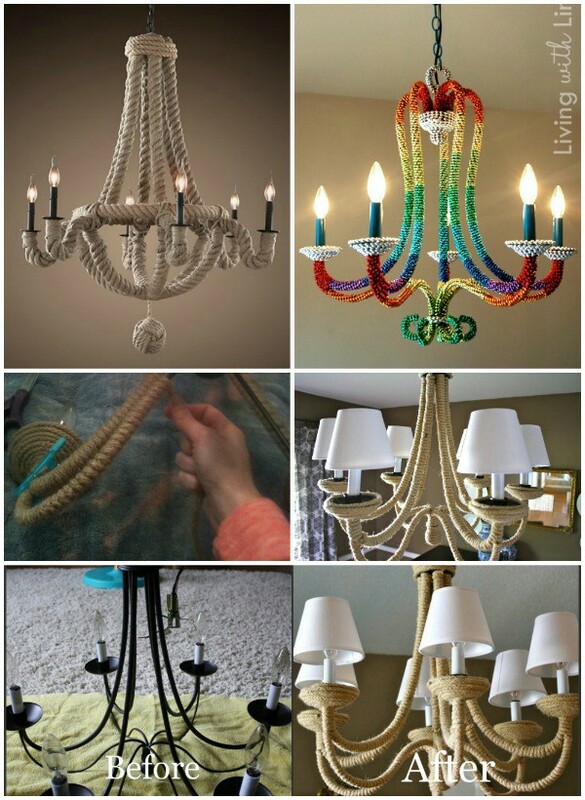 If you have a regular wrought iron chandelier that you’re bored of, you could do something as simple as wrap it in jute cording for a lighter, neutral, more natural looking version of its old self. For something a bit more colorful, get your hands on some cheap strings of beads; you can apply the same wraparound method with these! 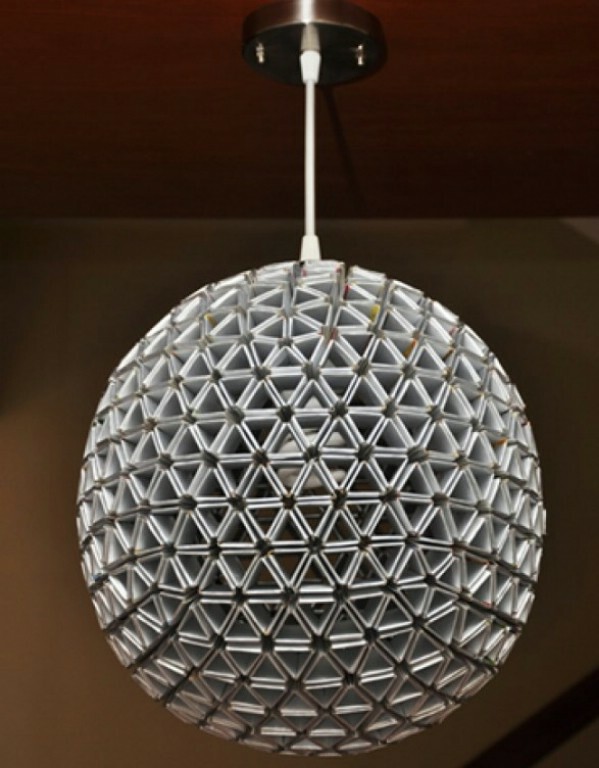 No one will ever guess that your bright, beautiful modern lamp is actually made from spray painted ping pong balls! This is great to brighten up a kid’s playroom, for example, or you can choose any color tone really to perfectly match your dining room. 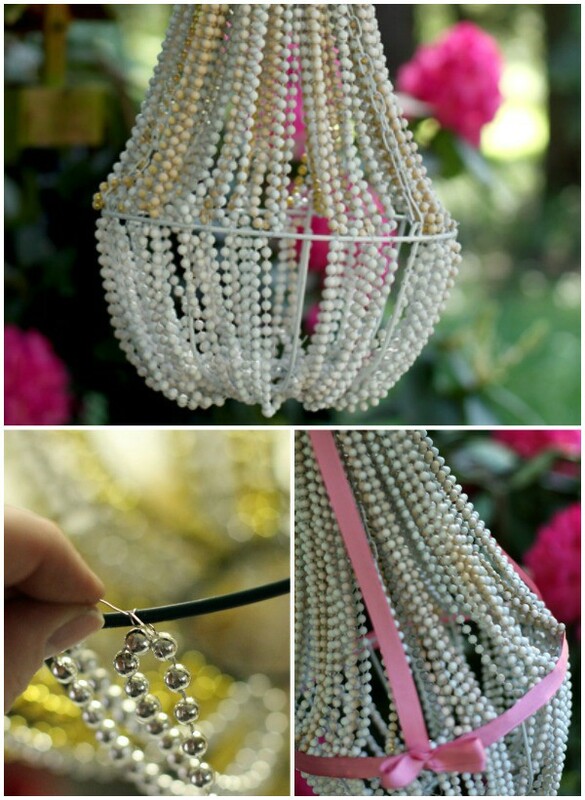 We love this beaded chandelier because it looks glamorous and elegant, and yet it only cost a few dollars to make. The base is actually a hanging wire basket, and the beads are cheap Mardi Gras-type beads that you can simply spray paint to your taste. People often forget about the beautiful shapes that nature gives us for free; a little bit of scavenging could reward you with an incredible chandelier-shaped dead tree branch. 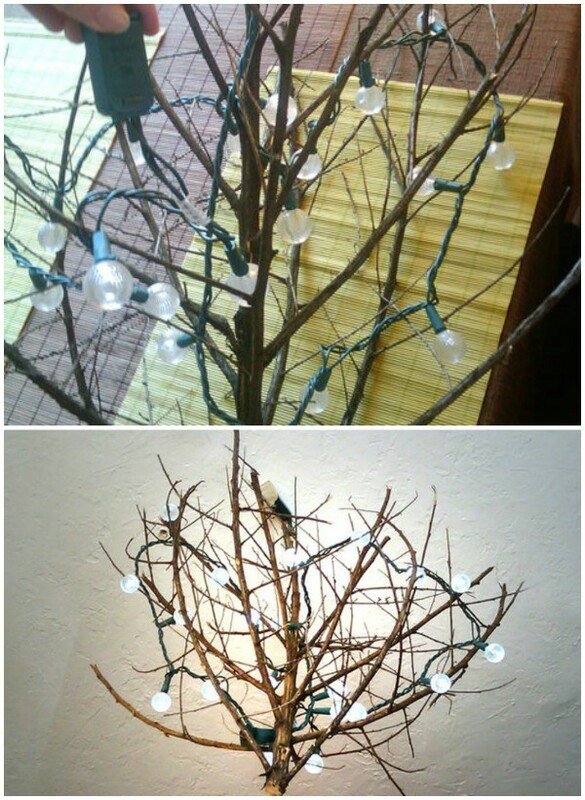 All you have to do then is clean it up a little and drape string lights (fairy lights) around it for an easy yet striking focal light source. Designer Ed Chew took his love for box juices to the next level when he created this incredible light source which not only serves as a work of art in a room, but also casts really cool triangular-shaped shadows when turned on. And you don’t have to stick with the ball shape, once you get the hang of folding the boxes you’ll see that it’s open to a lot of possibilities. REALLY PRETTY CHANDELIERS. 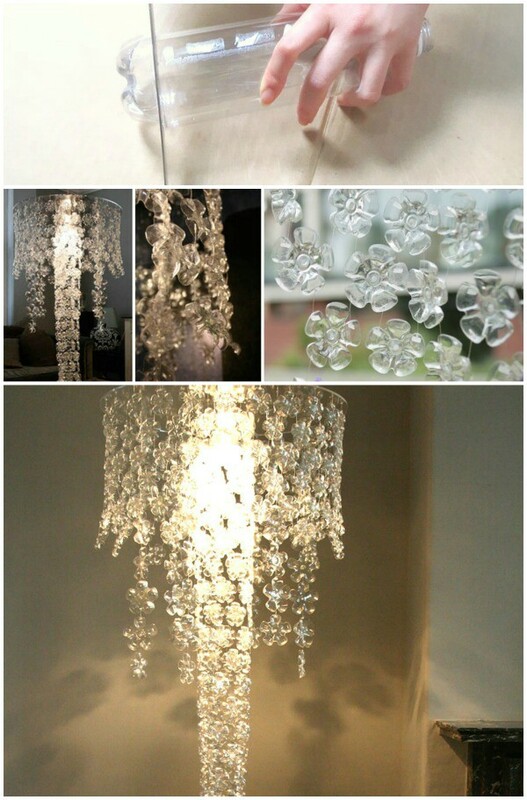 I JUST LOVE THE PET BOTTLE FLOWER CHANDELIER. AND I AM GOING TO TRY IT ON MY OWN AND POST IT. REALLY REALLY INTERESTING PATTERNS. LOOKING FOR MORE CREATIVE IDEAS. AWESOME……………. really such a new creative idea. Witam, Jestem pod wrażeniem jakie piękne rzeczy Pan robi . Uczę się dopiero i mam nadzieję że z też będę tak robić . 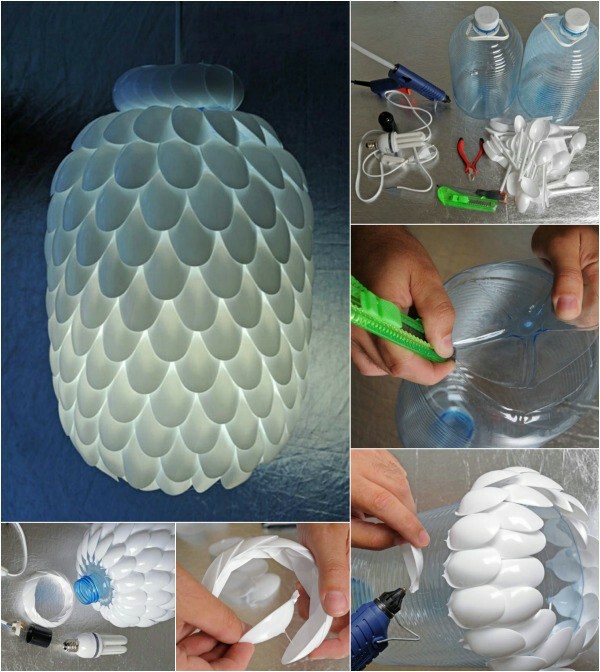 Is there a tutorial on the hanging “plastic bottle chandelier”? I can pretty much guess how to do it but it would be better if there was some kind of tutorial so that there aren’t any mistakes. Thank you. All of these ideas are just wonderful! !